When cellphones became fairly ubiquitous around 1998, I refused to buy one. For reasons too verbose (and some, too flimsy) to articulate, I didn't get one for a long time. In that period, most of my friends & colleagues had probably gone through about two models. Then, one late evening, my car had a flat in the middle of nowhere and I had to walk a fair bit to get to a payphone. The next day, I was the proud owner of an Alcatel phone! I thought, in this era of social networking, bump, and virtual cards, we could get by without 'non green' business cards. So, in the last few months of our company's existence, we avoided having one! But then, we're increasingly realizing that this isn't the best thing. At events & conferences, people (understandably) might assume you're not a 'serious' business. So, there I go - eating my words. Again. I must however confess to loving our design, especially the "relative to email" idea I picked up here. Oh, if you have a smartphone with a camera, download a QR Reader - and scan my QR code (showing on your screen). Yes, it works - it has my name, email, phone number URL, LinkedIn, twitter,and horoscope (just kidding)! Do you like our design? Too esoteric? Please let us know. 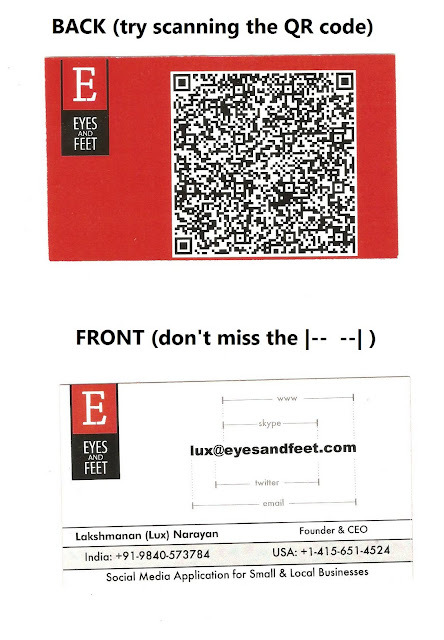 Heard about the QR in the past but never interested to know. Now QR is clearly explained to me through your blog. Thanks @krsna. About the design..I was referring to the front of the card - where we use the email address as an 'anchor' to convey our Skype ID, URL, Twitter handle, and of course, email address. I really liked the 'anchor' idea. Just have a feeling that it could have been conveyed in a more elegant way. Seems cluttered. It is just the critical me. Truly, good stuff. I agree with you - it could be more elegant/spacious. To give myself an excuse - I designed this on powerpoint and a DTP operator at a small shop recreated it in Corel Draw. But yes, should improve it for next time. A small point(CYA): the scans don't do justice to the card - eg. the lines don't look straight in the scan - but they are quite fine in the card.